Stop by our Fairbanks Toyota dealership today and get started on obtaining approved Toyota financial! Here at Kendall Toyota of Fairbanks, we know our neighbors work hard, play hard, and need a car that can keep up. That’s why we choose to offer the finest Toyota models at our dealership in Fairbanks. As part of a family owned and operated business, we believe in providing our customers with unrivaled service and our community with unprecedented outreach while selling quality new Toyota cars and used cars. If you’re interested in experiencing the Kendall family difference and finding your perfect match, stop by our showroom and treat yourself to a test drive. Our Toyota dealership is conveniently located at 1000 Cadillac Ct in Fairbanks, AK 99701-4380. We are only a short drive away from the surrounding areas of North Pole, Fort Wainwright, Delta Junction, and Eielson AFB. You’ll fall in love with the popular Toyota Highlander all over again, have a blast driving the fun and spirited Toyota RAV4, and respect the power of the available all-wheel drive on the tough Toyota Tundra. Browse the rest of our new Toyota inventory today for more ideas, feel free to contact our friendly and knowledgeable sales team online or over the phone if you have trouble finding what you’re looking for or have any questions. Interested in a pre-owned model instead? Take a moment to check out our inventory of used cars in Fairbanks. At Kendall Toyota of Fairbanks, we know that top-of-the-line quality and reliability are key selling points for any automotive purchase, new or used. With that in mind, we work tirelessly as your Toyota dealer to ensure all our used cars measure up to our stringent standards before they make it onto our lot. In addition to our selection of used cars, we have a variety of Certified Pre-Owned Toyota cars. To ensure top quality, our Certified vehicles go through multiple-point inspections and several tests. Shop our dependable used cars, then please give us a call or contact us online if you have any questions. 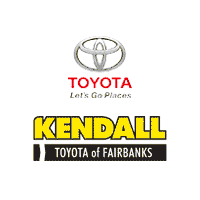 Kendall Toyota of Fairbanks recognizes how much our customers love their new Toyota cars and trucks and we want to help you increase the longevity of your investment by providing you with unparalleled automotive service that you won’t find anywhere else. Simply give us a call or schedule an appointment online and our Toyota Service Center will take excellent care of you and your vehicle with precision and efficiency. Looking for certified Toyota parts and accessories? Look no further than our Toyota Parts Center. Here at Kendall Toyota of Fairbanks, your needs are our priority and we’ll do our absolute best to ensure you leave with a smile. Because even though cars are what we sell, customer satisfaction is our business. We hope to see you soon at Kendall, where caring isn’t just a concept, it’s a way of life.